We Need Your Help for our Food Drive! 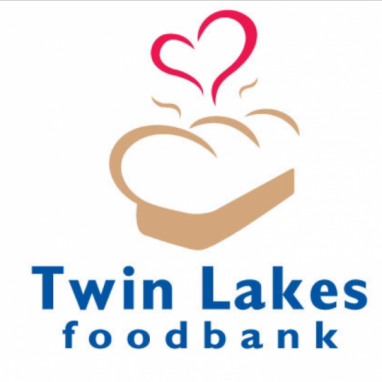 Hey folks, tomorrow, May 12, we’re holding a food drive for Twin Lakes Food Bank. The Food Bank has served families in need with supplemental food and clothing for in Folsom for over 30 years. Hard times can happen to anyone and your support ensures that help will be available to those who need it. The Food Bank has opened its heart to many of your neighbors. Oakmont Presents a Sweet Way to Give Back! 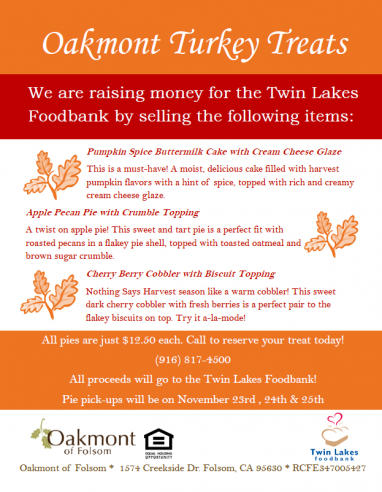 Oakmont Retirement Community has a sweet way of giving back this Thanksgiving! Their chefs are baking wonderful cakes and pies, selling them for incredibly low prices, and sending all of the proceeds to Twin Lakes Food Bank. Your choices are Pumpkin Spice Buttermilk Cake with Cream Cheese Glaze, Apple Pecan Pie with Crumble Topping, and Cherry Berry Cobbler with Biscuit Topping. 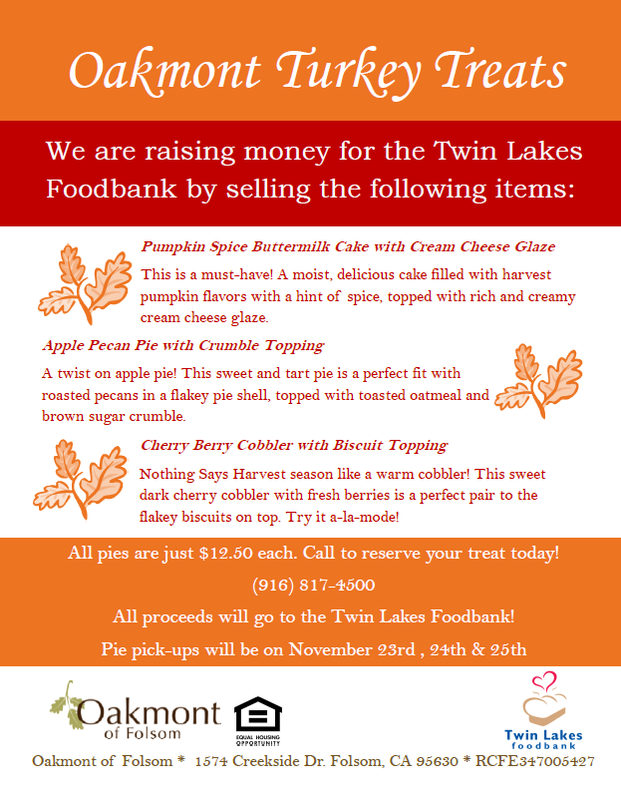 Order one or all three of these treats for your Thanksgiving table while giving back to the community. Each serves 10 to 12 people, and the cost is only $12.50. Call the Oakmont Concierge at 916 817 4500 today!